Bounteously gushing forth living grace for the faithful. Calemerus followed the directions of the prophet at the designated place and zealously applied himself to the task. When the sacred depository was disclosed by the aforementioned signs, the divine prophet appeared to him, clad in a white stole, which makes me think that he was a priest. At his feet outside of the coffin was lying a child which had been honored with a royal burial; for on its head was a golden crown, its feet were encased in golden sandals, and it was arrayed in a costly robe. The wise men and priests of the time were greatly perplexed about this child, who and whence he might be and for what reason he had been so clothed. It is said that Zechariah, the superior of a monastic community at Gerari, found an ancient document written in Hebrew, which had not been received among the canonical books. In this document it was stated that when Zechariah the prophet had been put to death by Joash, king of Judah, the family of the monarch was soon visited by a dire calamity; for on the seventh day after the death of the prophet, one of the sons of Joash, whom he tenderly loved, suddenly expired. Judging that this affliction was a special manifestation of Divine wrath, the king ordered his son to be interred at the feet of the prophet, as a kind of atonement for the crime against him. Such are the particulars which I have ascertained on the subject. Although the prophet had lain under the earth for so many generations, he appeared sound; his hair was closely shorn, his nose was straight; his beard moderately grown, his head quite short, his eyes rather sunken, and concealed by the eyebrows. From Ecclesiastical History, Book IX, Chapter 17. It should be noted, that the identity of who this Zechariah is seems to be confusing. Christian tradition sometimes mixed up three persons called Zechariah (Zacharias): the Old Testament prophet, the High Priest of II Chron. 24:20-22 who was killed by King Joash (Matt. 23:35), and the father of St. John the Baptist (Luke 1:5). Sozomen in his account identifies this Zechariah with the High Priest, who may have also been confused with the earlier Prophet, while later Christian tradition identifies him with the father of John the Baptist, who is also said to have been a High Priest. This confusion may have began in Constantinople. The Synaxarion of Constantinople identifies him with the father of John the Baptist, and it is he who is commemorated on February 11th. The exact identity however is still unknown. After the discovery of the relic of the Prophet Zechariah in 415, the Prefect Ursus brought it along with the relic of the Old Testament Patriarch Joseph to Constantinople, where it arrived on September 4, 415. It was immediately brought into the Great Church, and later transferred to the Church of Saint James the Brother of God. 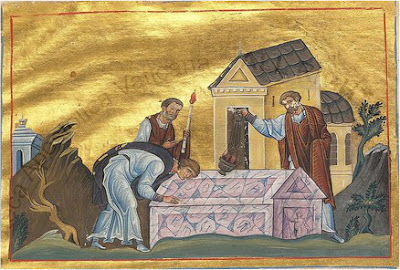 At some point, according to Patriarch Nektarios of Jerusalem (1661-1669), the relic of the Prophet Zechariah ended up in Italy. Today it is in the Chiesa di San Zaccaria (Church of Saint Zechariah) in Venice and is located a few meters southeast of the Basilica di San Marco (Saint Mark’s Basilica) on the Campo San Zaccaria. 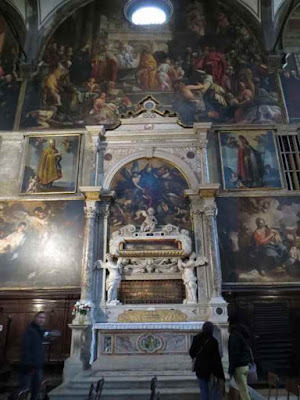 Opposite the San Zaccaria Altarpiece, in the right nave of the church, lie the remains of Saint Zechariah and Saint Athanasius of Alexandria. 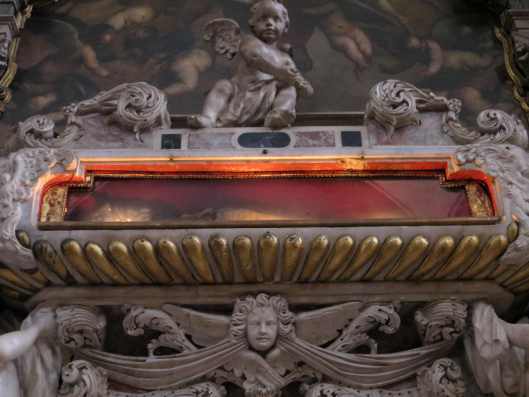 The altar and tomb of Saint Zechariah was designed by Alessandro Vittoria in 1599. Two marble angels hold Saint Zechariah’s tomb aloft, above the tomb of Saint Athanasius. Below, an inscription reads, “CORPUS S. ZACCARIAE, PATRIS S. JO: BAPTISTAE” (Body of Saint Zechariah, Father of Saint John the Baptist). The painting on the lunette directly above the altar is S. Zaccaria in Gloria by Jacopo Negretti, painted in 1599. A portion of the original discovered relic shortly after its discovery was also laid to rest in the Convent of Saint Melania the Younger during her lifetime near the Mount of Olives, along with those of Saint Stephen the Protomartyr and the Forty Martyrs of Sebaste. A small basilica, dated to the fifth-seventh century, with a burial crypt was unearthed recently (December 2010) in Herbet Madras by Amir Ganor and Alon Klein. It was suggested that this may have been the venerated site of the Tomb of Zechariah.